1 815,00 € tax incl. 1 512,50 € tax excl. "For the time being one of the best Cognac in the world"
Maison Plantevigne-Dubosquet produces only one Cognac - at the very top end of the select "niche” of great Cognacs. 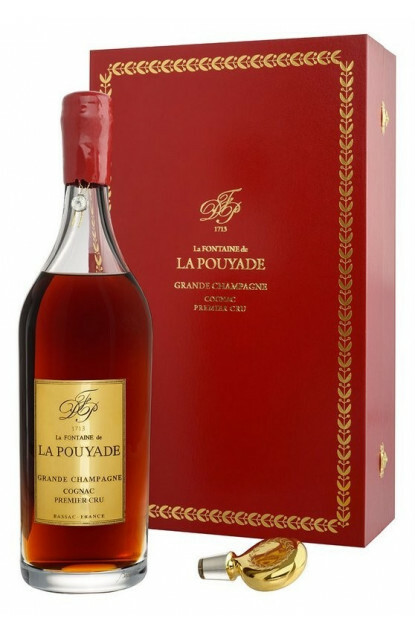 La Fontaine de la Pouyade is drawn exclusively from the heart of the Cognac Region, the Grande Champagne, which is legally classified as Premier Cru. All the grapes used in the creation of La Fontaine de La Pouyade come exclusively from the chalky hills of the delineated area of the Grande Champagne - Premier Cru. Here the sun's rays are at their most intense. This small zone furnishes lower yields per hectare than other Crus but, after longer ageing, its Cognacs develop aromas and flavours whose complexity and length are beyond comparison. Following distillation during the winter months, the Cognac begins the ageing process and, in the case of La Fontaine de La Pouyade, without reference to constraints normally imposed by time. Ageing takes place in ancient oak barrels, wrought from the heart wood of the tree, and takes place under the constant and attentive supervision of owners and cellars masters, over a number of generations. La Fontaine de La Pouyade is presented in a traditional wax sealed 17th century style Baccarat Decanter with a 24 carat gilded label made by master goldsmiths, personalized by a serial number engraved in the glass and copied on to a watermarked certificate. A few hundred bottles only are available each year for sale worldwide.